The Caped Crusader returns in this prequel to the Warner Bros. blockbuster film�The Dark Knight. After Wayne Manor is burned to the ground, Bruce Wayne establishes a new base of operations, and� as Batman�refines his personal vigilante mission, encountering foes both old and new. What I always find interesting about movie novelizations is how they add details, or switch things around just a teeny bit. Or, in most cases, that the scripts the authors work from are usually changed after the author has started working on the novelization. But this doesn't seem to be the case here for Louise Simonson's novelization of the upcoming direct-to-video Batman: Gotham Knight animated feature. Instead, Simonson has completely taken a different approach to the Batman: Gotham Knight story and has presented something that's both unique and a real page turner. From the heart of Gotham City and set in the time period between Batman Begins and The Dark Knight, Bruce Wayne continues his war on crime as the costumed vigilante known as Batman in Batman: Gotham Knight. With the unlimited resources of Wayne Enterprises at his disposal, Batman has access to the advanced tools and technology that have become his weapon in his battle against the underworld. New allies, enemies, and challenges await Batman, but he must also deal with old dangers and loose threads. Not everyone is thrilled that there is a Batman to protect Gotham City, and there are many who want to take down the mysterious masked crime fighter. As Batman fights his never-ending battle to protect those he loves and clean up his great city, he will grow closer to becoming a legend and fulfilling a destiny he never imagined. Now, what I found unique about this novelization is how it's not exactly a direct adaptation of the movie. Instead, it perfectly compliments the movie and, seemingly, only after reading both will you actually get the full experience of Batman: Gotham Knight. Now, the book isn't an essential read, but I believe that this novelization goes hand-in-hand with viewing the actual animated feature. Here we get a host of new scenes, new events, and a pile of new characterization that really fills in the gaps of the actual animated movie. On top of that, these new scenes help to better bridge the gaps viewers will likely come across when watching the direct-to-video Batman: Gotham Knight animated feature. This novelization not only ties six segments of the movie together, but also "picks and chooses" what it wants to keep, and what's irrelevant. And not only does it "pick and choose," but the novelization also moves around events, and merges separate stories into one. Toward the end of the book, when Batman is searching for Killer Croc, the book flashes back to Bruce's time in India. Now, in the movie itself, it's an entirely different situation which caused the flashbacks. It was a bit jarring, but, as the novel progressed, it made sense why Simonson chose to combine some events into one and it's actually really effective and gives added tension to the Killer Croc sequences because it adds resonance and weight to it. This novel also firmly plants itself in the Batman Begins continuity. There are direct references to both Ra's Al Ghul and the events of the first movie, as well as a few set-ups for the next film in the franchise. Surprisingly, the novel also sets up the appearance of a character who has yet to appear in the Batman Begins film continuity, a character who I was very surprised to see referenced. Before I go any further, let's take a quick look at the author's herself. Louise Simonson has had a long career in the comics field. In the early 80's she was an editor for Marvel Comics. She then became a full-time writer and worked on such titles as The New Mutants and The X-Factor. In the 90s she moved to DC Comics, where she wrote Superman: Man of Steel. Now a freelancer, she does writing for Marvel, Dark Horse, and DC Comics. Additionally, she has written thirteen comic-related novels and children's books featuring DC Comics characters and did the text for the Rizzoli coffee-table book, DC Comics CoverGirls. So, based on this, it's obvious she's no stranger to the work of comics, particularly to DC's Greatest Heroes. So, that considered, she really does have a handle on Batman's character, and what makes him tick, which, in effect, helps to fill the gaps in this story. Given that she's an accomplished storyteller, she also knows when to take risks and how to strengthen weaknesses. While I don't agree with all the changes she's done here, she really does add a lot to this book to really fill out the story and bring everything together nicely. However, there is a drastic change which might catch people off guard, and that's how the novelization deals with the Deadshot storyline. I love that Simonson adds a lot of background to it and, in fact, has it drive nearly the entire novel, only momentarily taking the backseat to the Killer Croc/Scarecrow story. However, when it reappears near the end of the book, some aspects of it have been changed. It's nothing major, just fans that read this novelization and then see the movie in July will notice that a lot has been changed, particularly the location of Batman and Deadshot's final duel. Now, I can understand why Simonson choose a new venue. It makes sense and works considerably well, although I can't vouch if it was absolutely necessary or not. Simonson also drops a guns-related subplot from Deadshot sequence and reworks it into a few bits earlier in the book. Simonson also approaches a lot of other aspects of the movie from a completely different angle. The characters from "Have I Got A Story For You" are used, as are some of the scenes that involve them, but here, it's just completely different. But, at the same time, the book stays true to the movie itself. It uses scenes from the movie, but just adds a lot of context to it. It's a really interesting mix which, for the most part, pays off. If there's any complaint, it's that, by really connecting all the segments into one cohesive hole, it does seem like there's a lot going on at times. It doesn't really hinder the story in any fashion, Simonson does have to keep it moving, but it seems like Batman really has a handful with all of these threats, new and old, to deal with at one time. One thing I really like is how she further develops the relationship between Detective Renee Montoya and Detective Crispus Allen. Their role is substantially larger than it is in the movie itself, and it actually adds weight to not only their partner relationship, but the dramatic shoot-out sequence we see both here and in the novel. I don't want to spoil it, but Allen and Montoya find themselves pinned inside a car when they are literally caught between two warring mob factions. It makes for a tense read, and Simonson handles the overwhelming danger of the situation perfectly. I found this book to be a real page-turner. I couldn't put it down. I was equally fascinated with the story itself and how Simonson interpreted it. Having already seen Batman: Gotham Knight, it was easy to place the dots, to see how Simonson adapted the movie itself into this new tale, but it was also easy to see why. 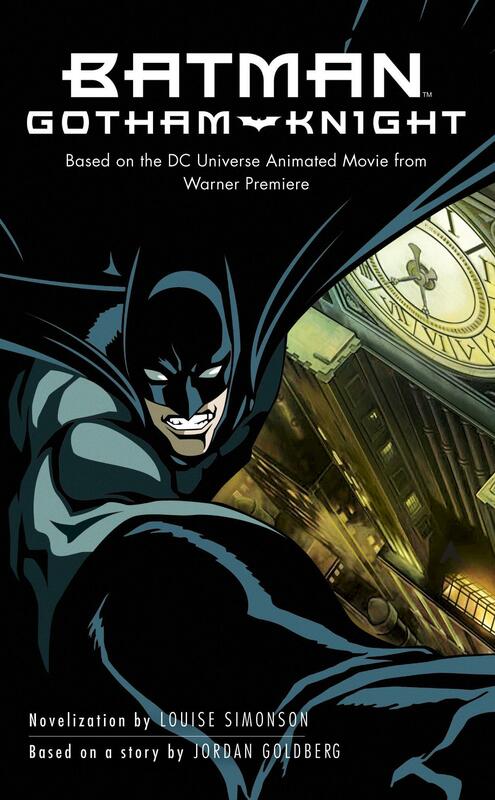 Batman: Gotham Knight works fine as a series of short stories, and that is the perfect avenue for an animated feature. However, as a novel, to tell a complete story, Simonson had to make changes, had to fill in the blanks herself, to make it seem like a cohesive story. While I don't agree with everything she did, such as the alterations she made to the final duel between Batman and Deadshot sticking out the most, to me. For fans looking for an exact retelling of the upcoming direct-to-video animated feature will be disappointed. However, fans looking for a great read and an alternate take of how Batman: Gotham Knight could have been should really check out this novel. Like I said, it's a perfect compliment to the animated feature and may give fans the complete they'll be looking for. The Batman: Gotham Knight novelization is well-crafted and a tense page-turner, and definitely comes Recommended. 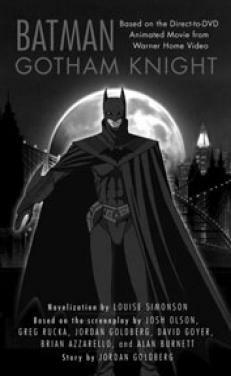 The Batman: Gotham Knight novelization is published by Ace Mass Market Original and will be on shelves May 27th, 2008.